You can export your contacts from the Contacts database. Select the contacts you want to export, and then click the Export button in the Actions drawer. A CSV file is prepared and you are notified when the file is ready to download. 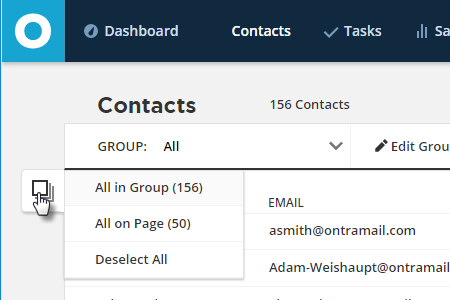 To select all contacts in that Group click the Select all items in group? link in the Actions menu. Select the fields you wish to include in the export. Use the Select All button to select all the fields and the Clear button to start over selecting fields. Note that if you use the Select All button the export will include all personal coupon codes as well. When you export a coupon code, and it is set to expire after a certain number of days, the timer starts upon successful export. You can also export PURLs and notes. ONTRPORT PURLs are created for all the landing pages you have created. If you want to export notes, select the check box at the bottom of this selection box. 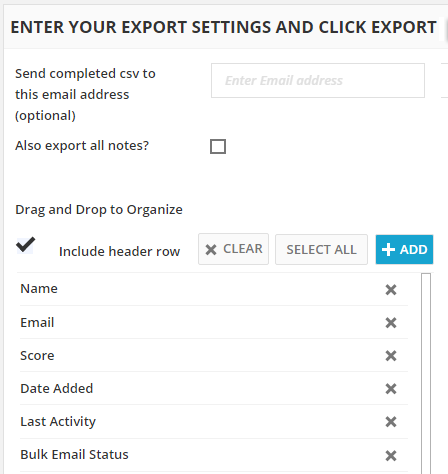 Remember to enter your email address at the top and click the Export button to initiate the export process. ONTRAPORT will notify you via email when the export file is ready to download. The notification email will include a link to download the export CSV file. If you are unable to receive the email, you can click your email address, select Administration and then Exported Lists from the Data Section to access the saved export file. ONTRAPORT will keep the list available for 60 days in Exported Lists. You can access this archive by clicking the profile icon at the top right then selecting Administration. The Exported Lists archive is in the Data section. Export files are stored for 60 days in Administration > Exported Lists, and then deleted. If you cancel your account, you cannot access the Exported Lists area. You can also export sales data in the Sales > Reports section.